We try to understand the world around us. This is the purpose of science, and the scientific process starts with simple and then carefully controlled observation. Experimentation is the final phase of the process, but this is not always possible due to a variety of constraints. We have looked at Hill’s criteria of proof, but observation is of great importance. We all know as the result of careful observation that lung cancer isusually caused by cigarette smoking. People who smoke heavily have, after thirty years, a higher death rate from lung cancer than those who smoke few cigarettes or who do not smoke at all. About 10 % of heavy smokers will die from lung cancer, but it is exceptionally rare in non-smokers. There is an intermediate death rate in moderate smokers. As only 10% of heavy smokers die from lung cancer, there must be co-factors. There must be one or more reasons why these 10% are subject to the bad luck of lung cancer whereas the majority of heavy smokers have managed to avoid this cause of death. A reason why someone does not die from one disease is that he or she dies from something else earlier, perhaps warfare or childbirth. Although dying from something else might be a factor in protecting 90% of heavy smokers from dying from lung cancer, it is not just this. Coronary heart disease (CHD) is a major cause of death associated with cigarette smoking. We have also seen in a previous post that at the time of the study 20% of people died as a result of CHD, irrespective of whether they smoked or not. But cigarette smoking brings forward death from CHD by about 10 years. The death rate at the age of fifty years is twice as high in heavy smokers as in non-smokers, but cigarette smoking does not increase the lifetime CHD death risk. Greece appears to be a location in which the population is somehow protected from the adverse effects of smoking. The gradient of increasing smoking related deaths as we move from southern Europe to northern Europe suggests that this might be an effect of the climate. The suspicion from this observation is that the sun might be protective, and there are many other examples of this. Is there any other observation that the sun might be protective against lung cancer? The answer is "Yes". Dr AG Kargar of Basle recently reviewed 12 observational studies that have investigated people with lung cancer and compared them to controls without lung cancer. The objective was to review the relationship between lung cancer and vitamin D status, judged by either intake or blood levels. The higher the blood levels of vitamin D, the lower the risk of death from lung cancer (standardised for number of cigarettes smoked and duration of smoking). The result was that the greater the vitamin D status, the less was the risk of lung cancer. We can see this in Figure 1. In column 2 the risk of lung cancer in people with the lowest blood level of vitamin D is standardised as 1. Those with the highest blood levels of vitamin D (column 1) have a lower relative risk of lung cancer at 0.84. We see then same when we look at the dietary intake of vitamin D. The risk of lung cancer is lower in those with high intake (column 3) compared to those with the lowest intake of vitamin D (column 4). The author suggests that: “Further studies are needed to investigate the effect of vitamin D intake on lung cancer risk and to evaluate whether vitamin D supplementation can prevent lung cancer.” This is a standard way of ending the report of an observational study and it is of course self-evident. The scientific process is like a wheel that continually rotates to create an increasing understanding of the world about us. However it must be remembered that there is more to the sun than vitamin D. Vitamin D is an index of sun exposure as well as being an active vitamin (pre-hormone). It is necessary to evaluate whether vitamin D supplement can “prevent” (that is, reduce the risk of) lung cancer, but also whether controlled sun exposure has a similar or even greater benefit. This would lead us from observation to experimentation. It would require a prospective randomised controlled trial (RCT) of a volunteer group of people. It would take many years to reach a conclusion, perhaps 30 years. The organisational challenge would be immense and the cost very high. It is unlikely to take place because of these challenges and the lack of the financial rewards that are the hopes of pharmaceutical innovations. There is another observation that suggests that the sun is of benefit in the outcome from lung cancer. If the diagnosis and treatment of lung cancer occurs in the summer as opposed to the winter, then the outcome is much better. 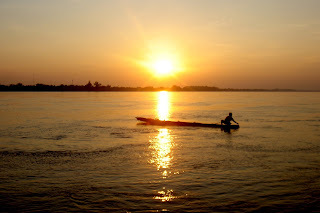 It is difficult to think of an explanation other than that the sun gives a survival advantage. A further observation indicates an advantage in those taking vitamin D.
Figure 2: Survival from lung cancer and time of the year. We can see in this Figure 2. 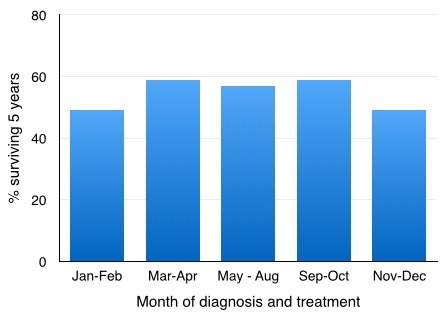 Survival from lung cancer is worse if diagnosis and treatment occur in the winter months (columns 1 and 5) compared tot he summer months (columns 2,3,4). If we then add the effect of taking or not taking a vitamin D supplement we can see an additional important effect. Figure 3: Outcome from lung cancer, season and vitamin D supplement. In Figure 3 we see the season effect repeated, but now we can see the additional effects of taking (yellow column) or not taking (green columns). 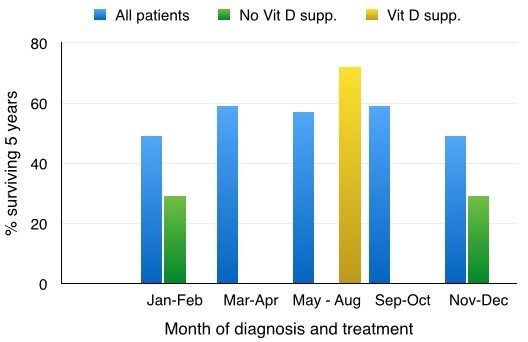 The best survival of 70% (yellow column) is in those who are diagnosed and treated in the summer and who are taking vitamin D supplements. The worst survival (30%, green columns) is in those diagnosed and treated in the winter and not taking vitamin D supplement. If someone smokes of cigarettes, then it is advisable to stop. If not, it is advisable to improve vitamin D status by maximising sun exposure (but avoiding sunburn), or taking a vitamin D supplement by mouth, or both. Perhaps the best plan is to live in Greece (see Post - Greece and also Post - Sir Patrick Leigh Fermor). The important thing is that the way to reduce the risk of lung cancer is not to smoke. The purpose of this post is to draw attention to the importance of the sun on human health and its likely benefit in respect of cancer.